The solar thermal hot water system is shown in the figure below. It is mounted on the south side of the roof of the house. The standard roof on this production house floor plan is a gable roof, so there would be no south facing portion for that type of roof. The builder kindly modified that portion of the roof (without additional cost) to a hip roof, with that modification addressing two issues at once: (1) providing a place for the solar thermal panel, and (2) providing a roof that would allow an overhang to shade the high solar gain windows on the south side during the summer. The yearly average solar radiation on a flat plate collector aimed due south and tilted at an angle equal to the latitude is 5.9 kW/m2/day at this location in Colorado. The solar hot water preheater was sized for one or two inhabitants at the Residential Energy Laboratory. A single panel with 2.32 m2 (25 ft2) absorber area was mounted on the roof with a pitch of 9/12, corresponding to an angle measured from horizontal of 36.9°, close to the latitude of 38.6°. Optimum tilt angles for solar thermal systems vary from matching the latitude, which results in the panels most closely facing the sun averaged over the year, to lower tilt angles to take advantage of clearer weather and longer days in the summer, to higher tilt angles to favor improving collection in the winter when collection efficiencies are lower. The optimum tilt depends on the system objective, trying to meet 100% of the heating requirements versus preheating water for another heater, and local weather patterns. This problem is discussed further in the Energy Efficient Design section. 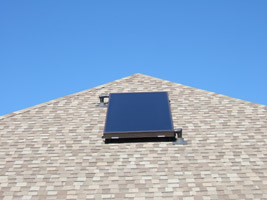 The solar thermal collector is mounted flat on the house roof, which results in an angle 22° east of south. As discussed in the section Energy Use - Photovoltaic System, this angular deviation probably results in little or no loss of energy collection efficiency. Storage of the solar-heated water was accomplished with the 189-liter (50-gallon), stainless steel, storage tank shown in the picture below. This tank was used to store the solar preheated water, and did not include any axillary heating mechanisms. 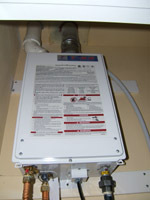 The solar-preheated water was fed to a natural-gas fired, tankless water heater with variable input firing range from 3.2 to 58.3 kW (11,000 to 199,000 Btu/hr), which is shown in the image below. Evaluating the performance of the solar thermal hot water system is made difficult by the fact that the controller is not instrumented, and a complete evaluation requires recording not only the energy collected and stored in the tank, but also the energy delivered to the house, since significant cooling can occur in the solar storage tank. Only indirect performance information is available, such as the fact that natural-gas consumption is quite low during the summer months when there are no space heating requirements, as shown in the figures below with natural gas consumption expressed in kWh, in the first figure, and CCF (hundreds of cubic feet of natural gas), in the second figure. To put these values in perspective, measurements at a previous house that had a conventional natural-gas fired water heater and with the same occupant load (mostly one person), resulted in summer-time natural gas usage of about 470 kWh (15 CCF). Since the current house uses natural gas for "topping off" the domestic hot water as well as cooking, the solar thermal system appears to provide more than 90% of the energy requirement for heating hot water in the summer. This result should not be extrapolated to the colder months where the average temperature in the solar storage tank is significantly lower than in summer months. Hopefully instrumentation will be added in the future to more directly monitor the performance of the solar thermal system.